A third person RPG title set in the Star Wars universe, one of the world’s most famous science fiction franchises. The game was created by BioWare Studios, mainly known for the legendary series Baldur’s Gate. publisher : LucasArts | Aspyr Media, Inc.
One of the most popular cRPG games set in Star Wars universe. This title was developed by BioWare Studios, the authors of such titles as Baldur’s Gate and Neverwinter Nights. The game debuted on Xbox and PC in 2003. For its 10th anniversary Star Wars: Knights of the Old Republic was ported to iOS devices, and a year later the title hit Android as well. Let alone UI, the mobile versions are almost 100% copies of the original title. The game released on PC, AND and etc. is set in the so-called Old Republic period, 4,000 years before the Battle of Yavin, i.e. the events featured in the original Star Wars trilogy. Players can embrace the dark or light side of the Force and take part in the age-old conflict between the Republic and the Sith. As you progress in the game you discover your character’s past and identity, and learn Jedi skills. On your quest you get to visit the planet of Tatooine and other worlds in the vast universe of Star Wars – both known from the film saga and brand new ones. Gameplay mechanics are based on d20 system, created by Wizards of the Coast for the third edtion of Dungeons & Dragons tabletop role-playing game. The system was adjusted to the Star Wars universe. Moreover, in contrast to previous BioWare games, this one features full 3D graphics with dynamic camera. As you play, you control a party of heroes representing 9 different classes, each one with unique abilities. Combat take place in real-time and features an active pause, which adds extra tactical depth to skirmishes. 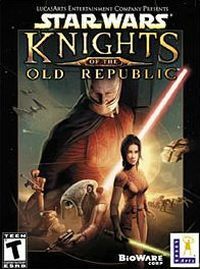 As befits a purebred cRPG Knights of the Old Republic for PC, AND and etc. offers extensive character progression system. There are many choices between the light and dark side of the Force, which have great influence on how the story unfolds. Characters can be developed in multiple ways, choosing and mastering over 40 Jedi skills. You can also make use of a wide variety of unique items and artifacts, as well as the iconic weapons of the Star Wars universe, such as blasters and lightsabers.